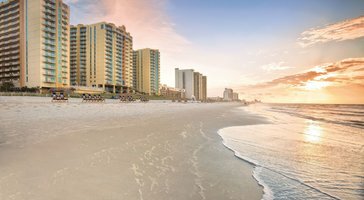 With six pools and two lazy rivers, this action-packed family resort is located right on the beach in North Myrtle Beach. Cruise on one of two lazy rivers that look out over the ocean and let the water cool you down in the Carolina sunshine. Grab a drink or refreshing iced tea at the pool bar while the little ones play. There’s tons for kids to do from the game room and playground to movie nights, games, and crafts. 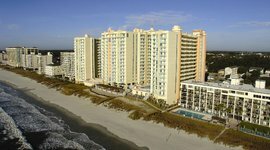 Condo rentals come with full kitchens, living and dining rooms, whirlpool tubs, private balconies, and in-unit washer/dryers.